From as early as she can remember, Lindsay MacKay (née Fry) has been intrigued by drawing and painting. In 2008 she completed her Bachelor of Fine Arts at the Ontario College of Art and Design. Today, she is pursuing a full-time professional career as an artist. Always up for a challenge, Lindsay loves taking risks, working on a large scale and painting with bold, confident brush strokes. She paints in a variety of mediums including oil, watercolour, aerosol and acrylic. 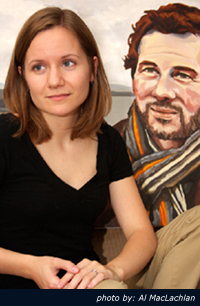 Lindsay enjoys working with diverse subject matter, from portraiture and landscape to still life and semi-abstracts. Lindsay has had the privilege of exhibiting her paintings in numerous juried shows through which she has gained valuable experience and recognition. Along the way, she has benefited greatly from awards and generous bursaries from the Toronto, Almonte, and Carleton Place communities. Currently, Lindsay is living in the Durham region with her husband, (musician) Geordie MacKay. She works from her home-based studio where the lakes and rolling countryside provide a wealth of inspiration. For any questions, comments, or availability regarding commissioned work, feel free to send Lindsay a message!